The Sound Settings dialog box lets you set the audio compression settings when you want to export a QuickTime Movie (.mov) file. 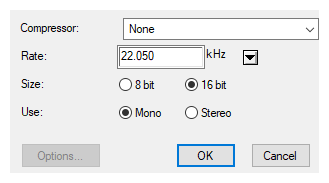 Lets you select the audio rate at which to export. It is best to export your audio at a rate that matches the rate of your original sound files. For example, if your file has an audio sample rate of 48 kHz and you choose a conversion rate of 22.05 kHz, the sound will play at the same speed, but higher frequencies will be missing, making it sound muffled. For reference, the standard sound quality is 48 kHz for broadcasting and DVD. Lower rates are liable to impact the quality of your movie's soundtrack negatively, but they can be useful if disk space or download speed is critical.